What happened to the wild beast called “human”? Caged in a zoo we live our lives, and some of us take on other wild companions, dogs, cats – giant cats even. MING OF HARLEM: TWENTY ONE STOREYS IN THE AIR reveals the wonder and poetry behind the true story of an “animal situation” the police had had to sort out in Harlem. Antoine Yates had lived together with tiger Ming and alligator Al in the 21st floor of the Drew Hamilton Housing Projects in Harlem. When I saw the entrance to the building my middle European eyes said “Underground or bus station entrance”, “hospital” … and very soon my soul said “zoo”. Who makes us wild human beasts live like this? Confined in a silo stuck in a city? Surrounded by noise and concrete? 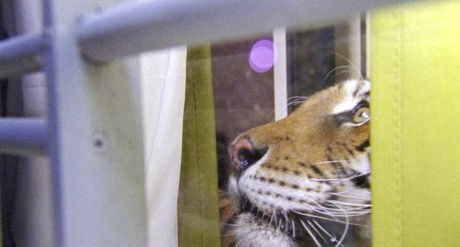 This documentary mixes real feature material with Yates’ memories and the surreal studio pictures of a giant adult tiger in a normally sized human habitat – and it does so in the most stunning and poetic way one could imagine. The poetry by Jean-Luc Nancy alone, recited like a prayer over images of wonder and awe accompanied by the marvellous music of Hildur Gudnadottir are worth every second spent watching this film. This is by far the best documentary – no, by far the most remarkable film – I hadn’t yet mentioned in 2014. Thank you for screening it, Viennale. The 71 minute piece of art MING OF HARLEM by Phillip Warnell reveiced the Prix FID Marseille.